I mentioned when I posted my Blackberry Crumb Bars that I’d be sharing more blackberry recipes with you, and here’s another one! These muffins are easy to make, with a thick, creamy batter that bakes into yummy moist muffins with lots of blackberries in every bite. And sprinkling them with some coarse sugar before putting them in the oven gives these muffins a light sugary crusted top. I like the little sparkle the coarse crystal-like sugar gives the muffins, too. Preheat oven to 375˚F. Fill muffin tins with 18 paper liners; set aside. In a large bowl, cream butter and 1 1/4 cups sugar. Add eggs, one at a time, beating well after each addition. In a medium size bowl, combine the flour, baking powder, and salt. Gradually stir this mixture into the creamed mixture alternately with the Half & Half, beating well after each addition. Fold in the blackberries. Fill paper-lined muffin cups two-thirds full. Sprinkle tops with the coarse decorating sugar (or use granulated sugar). I used 2 Tablespoons of coarse sugar for my lightly sugary muffin tops–for a heavier sugar coating, use 3 Tablespoons. Bake at 375˚F for 18 to 20 minutes or until a toothpick inserted in center comes out clean (I used fresh berries; baking time might be a few minutes longer with frozen berries). Cool 5 minutes before removing from pans to wire racks. Serve warm. These muffins are great for a summer breakfast or snack. Hope you enjoy them! Linked to Simply Sundays, Nifty Thrifty Sunday, Sunday Features, Inspire Me Monday, Show and Share, Tickle My Tastebuds, Wow Me Wednesday, Wow Us Wednesdays, Wake Up Wednesday, Whimsy Wednesday, Full Plate Thursday, Create It Thursday, Showcase Your Talent Thursday, Living With Style, Share Your Style, Thursday Favorite Things, Inspiration Thursday, Fabulous Foodie Fridays, Feathered Nest Friday, Foodie Friday. 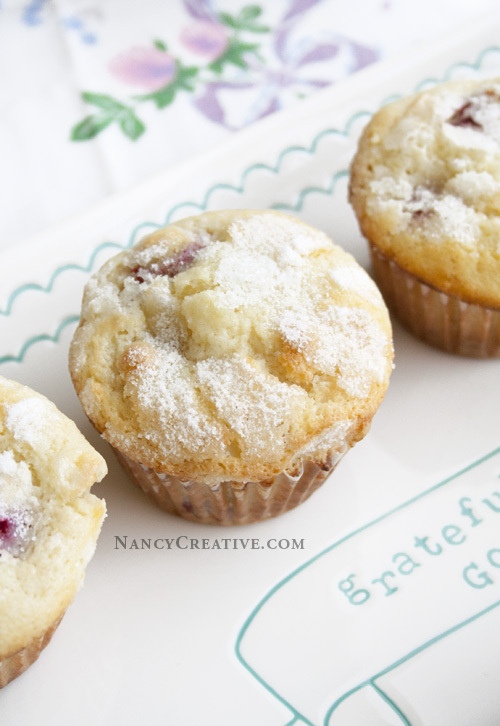 This entry was posted in Breakfast/Brunch, Food and Recipes and tagged blackberries, blackberry muffins, sugar crusted on August 16, 2015 by nancyc. Lemon is such a great springtime flavor and this past weekend seemed like the perfect time to make some lemon-flavored muffins! I found a recipe on Pinterest that inspired me, and it also inspired one of my friends to convince me to make them so she could taste-test them! 🙂 So I ended up making these Lemon-Raspberry Muffins with some changes of my own. I used Half and Half (light cream) and yogurt to make them a little more rich and creamy and used lemon extract instead of vanilla for a little extra lemony flavor. And I made two batches with different toppings–sugar-crusted, like the original recipe, and lemon-glazed, which gives the muffins an extra zing of lemon flavor. The glaze I used is the one from my Lemon Zucchini Loaf, which is another good recipe if you are a lemon-lover! These muffins are so moist and have a light, sweet lemon flavor. And they’re packed with lots of raspberries! 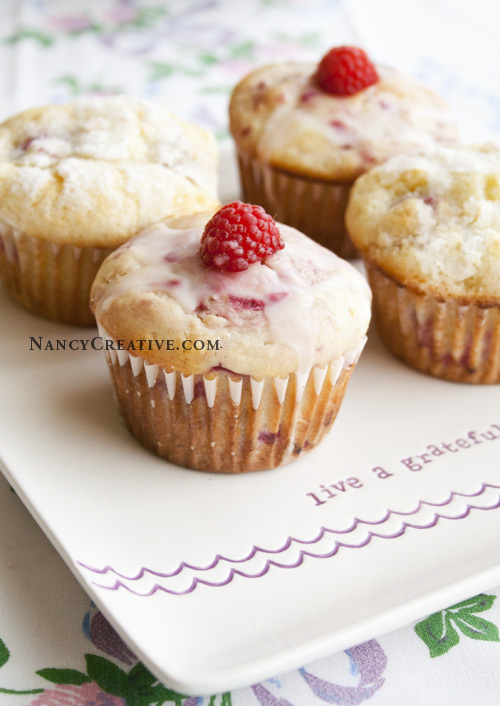 If you decide to glaze the muffins (shown in the photo above), adding fresh raspberries as a garnish is a nice touch (just slice the berries in half lengthwise). I love this little bowl that holds some of the berries I used-it’s actually a sugar/candy bowl, but it works great for berries, too! It’s part of the Daily Grace Collection by (in)courage, sold on DaySpring.com. The platter, square salad plate and pitcher are also from this collection. I really like the clean simplicity of these pieces and the simple, sweet messages of grace and gratefulness! Heat oven to 400˚F. 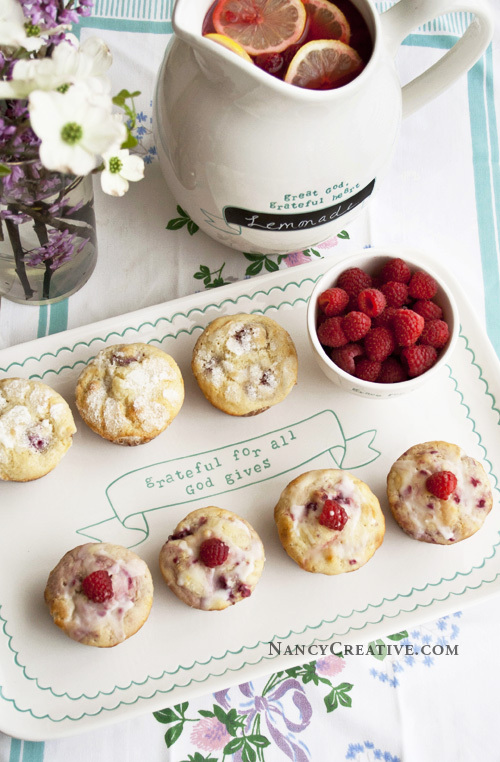 Line a 12 cup muffin tin with paper liners or spray with cooking spray. In medium bowl, combine 1 3/4 cups of the flour, 3/4 cup sugar, baking powder, and salt. Add butter and stir to mix together (this will give you a crumbly-looking mixture). In another medium bowl, whisk together the Half and Half, yogurt, egg, lemon extract, and lemon juice (you’ll add the lemon zest a little later). Gradually add this mixture to the flour mixture and stir until just combined (batter will be lumpy). 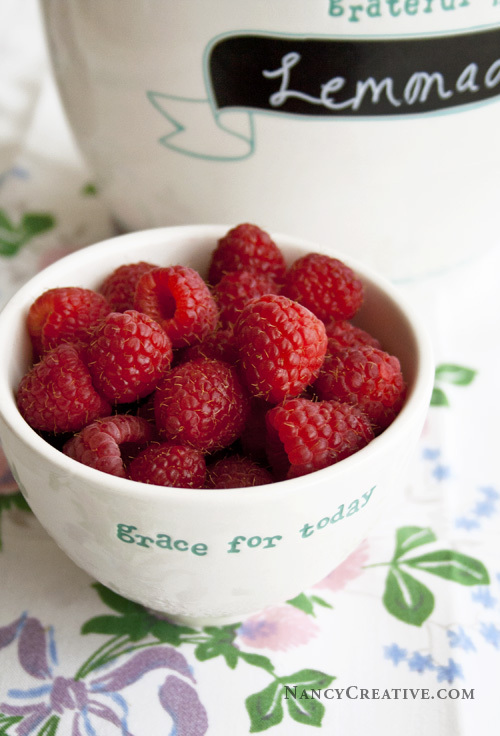 In small bowl, toss the raspberries and lemon zest with the remaining flour. Gently fold the berry mixture into the batter. For Sugar-Crusted muffins: Using 2 to 3 Tablespoons of sugar, sprinkle tops of muffin batter before baking. Bake at 400˚F for 17 to 20 minutes or until toothpick inserted in centers comes out clean. Transfer pan to wire rack to cool for 10 minutes before removing the muffins. Then you can serve the muffins warm or let them cool completely–they taste great both ways! For Lemon-Glazed muffins: Bake at 400˚F for 17 to 20 minutes or until toothpick inserted in centers comes out clean. Transfer pan to wire rack to cool for 10 minutes, then remove muffins from pan and cool completely on wire rack. 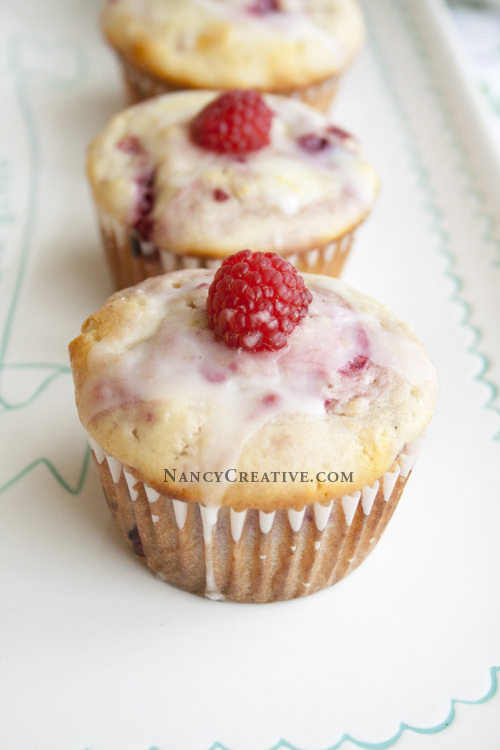 Mix Lemon Glaze and drizzle over each muffin, then top with a fresh raspberry half if desired (raspberries should be cut in half lengthwise for garnish). In small bowl, mix powdered sugar and lemon juice until well blended. Spoon glaze over cooled muffins (or loaf). Let glaze set, then serve. These muffins are great for breakfast, brunch, an afternoon snack, or even dessert. And since I was in a lemon-raspberry mood, I also made a pitcher of Raspberry Lemonade to go with them. Yum! I’ll share that recipe with you in my next post! Do you like lemon-flavored goodies, and what is your favorite lemony treat? Linked to Inspire Me Monday, Nifty Thrifty Tuesday, Wow Us Wednesday, Full Plate Thursday, Favorite Things Thursday, I’m Lovin’ It, Six Sisters’ Stuff. This entry was posted in Breakfast/Brunch, Food and Recipes, Muffins, Biscuits, Scones and tagged (in)courage, baking, Daily Grace Collection, DaySpring, featured, lemon, lemon glaze, Lemon juice, Lemon Raspberry Muffins, Lemon zest, muffins, Raspberry, sugar crusted on April 14, 2014 by nancyc.